Mutual funds investment gather money from a lot of investors and create a corpus. The corpus (i.e. the pool of money) is then divided for investment into different companies and income generating opportunities. While there is no guarantee that any mutual fund scheme will achieve its goals due to the factors of risk and ever-fluctuating markets, debt mutual funds strive to minimize risk by picking the least risky types of investment instruments. Debt mutual funds invest the majority of their corpus in fixed-income or fixed-interest generating opportunities and instruments. 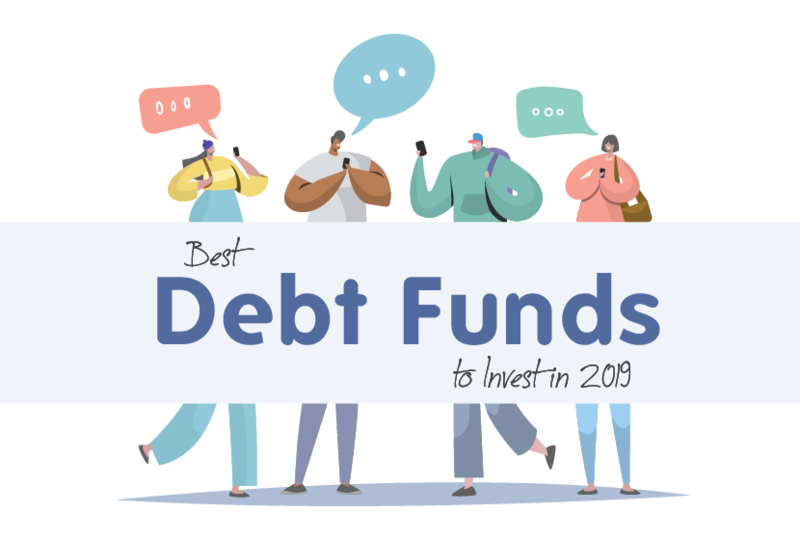 Some examples of the instruments debt funds invest in are - money market instruments, corporate bonds, treasury bills, government securities, commercial papers, etc. By investing primarily in these opportunities, debt mutual funds reduce the risk factor by a huge margin. As a result of this, the mutual fund scheme also reduces its chances to generate exponential returns like those of successful equity fund schemes. It’s a safer option that seeks to generate income better than fixed deposits rather than high returns. Debt funds are different from equity funds in many ways - the primary of which is the chosen investment instrument or opportunity. How does an debt mutual fund work? Unlike equity mutual fund schemes that seek to gain capital appreciation through investments in the equity stocks of companies, debt mutual funds attempt to deliver stable and low-risk returns that are usually better than fixed deposits. The reason that they are able to do this is that they invest in instruments that provide a fixed rate of returns. While this rate of returns is usually quite low, risk-averse investors prefer this form of investment as it does not place their investment at a great deal of risk. The choice and decision of which debt instruments will be purchased by a fund scheme are dependant on its credit rating. Credit ratings for debt instruments and securities indicate the likelihood of the instrument to honour its interest payments and the eventual principal repayment at maturity. The higher the credit rating, the greater the likelihood of the interest and principal being repaid on time and in full. So, the higher the rating of the debt instruments chosen, the lesser the risk that the mutual fund may not receive all its dues. Income funds are a type of debt mutual fund that attempts to provide a stable rate of returns in all market scenarios through active portfolio management. While it is a debt fund, income funds also run the risk of generating negative returns as many scenarios could play out - such as - interest rates may drop drastically, resulting in a drop of the underlying bond prices. It’s even possible that the active fund manager could pick lower-rated instruments that could offer potentially higher returns. Through active and ‘dynamic’ portfolio management, dynamic bond funds seek to maximize the returns to investors by switching up the investment portfolio depending on market conditions and fluctuations. The entire point of investing in a liquid fund is to maintain a high degree of liquidity (i.e. convertibility to cash/cash value) in the investment. Securities and instruments that are invested in by liquid fund schemes have a maximum maturity period of 91 days. Usually, only very highly-rated instruments are invested in, through liquid funds. The benefit of these funds is primarily felt by those investors who have surplus funds to park in an income generating investment. The reason these are preferred is that they give higher returns than savings accounts and attempt to provide a similar level of liquidity. These funds are the riskier type of debt mutual funds. They undertake calculated risks like investing in lower-rated instruments to generate potentially higher returns. Anticipating a rise in ratings of papers through market analysis, credit opportunities fund managers invest in instruments rated under even “AA”, in the hope that they will rise to become higher-rated over time, and thus, increase in value. These fund schemes are popular among new investors who want a short term investment with minimal risk exposure. The securities, instruments, papers, etc. that are invested in by these schemes have a maximum maturity of 3 years and usually a minimum maturity of 1 year. These schemes invest primarily in government-issued securities which carry a very low level of risk and are generally rated quite high (as the default rate is very low and sometimes non-existent). What these schemes lack in risk-taking ability, they more than make up for, in security. Fixed maturity plans can be closely likened to fixed deposits. These schemes have a mandatory lock-in period that varies depending on the scheme chosen. The investment must be done once, during the initial offer period, after which further investments cannot be made in this scheme. The way in which it differs from FDs is that the returns are not guaranteed, but if they do generate positive returns, they will be most likely higher than any bank FD scheme. Risk-averse investors generally choose to invest in debt fund schemes. Investors that are happy with the possibility of a low, but regular rate of returns versus high-risk exposure capital appreciation equity funds choose debt fund schemes. You have surplus funds to park for a while, and don’t mind taking a small bit of risk for the possibility of returns higher than a savings bank account or a fixed deposit. You aren’t willing to place your money at as much risk as an equity fund. You prefer the possibility of small but stable returns over the possibility of large capital appreciation. You are unhappy with the current rate of returns provided by your savings bank account. You wish to earn higher returns than an average fixed deposit scheme. You wish to supplement your current income - i.e. if your current salary is not able to meet the demands of your lifestyle, you could invest in a debt mutual fund scheme to add a certain amount of “income” (in the form of returns) each month. The securities, papers, bonds, instruments, etc. that debt fund schemes invest in are rated by credit rating agencies based on their past performance and perceived value. This refers to the time in which you wish to achieve your financial goals through investments. Debt mutual funds have schemes that fit almost any investment horizon - like liquid funds for 3 - 12 months, bond funds for 24 - 36 months, dynamic bond funds for 36 - 60 months, etc. This is the primary purpose of investing in debt mutual funds, and the factor based on which most people pick their schemes. Despite the fact that debt fund schemes aim at reducing the risk and establishing regular returns, nothing in the world of mutual fund investing in guaranteed. Debt mutual fund schemes are also liable to be charged capital gains tax. Short Term Capital Gains (STCG) Tax is applicable to capital gains earned on a scheme that’s been held for 3 years. Long Term Capital Gains (LTCG) Tax is applicable for capital gains earned on a scheme that’s been held for over 3 years. The primary benefit of debt funds is the extremely low risk to which they expose their capital. Even so, debt schemes are not risk-free - suffering from two very distinct and real types of risk. Credit risk, for example, is when the fund manager invests in securities and instruments with a low credit score/rating - exposing the investment to a high probability of default. Interest risk is another very real risk of debt funds wherein an increase in the interest rates would drastically lower the value of related bonds. Step 4: Talking to our team of investment advisors and market analysts about your investment history, risk-taking ability, investable amount, etc. Step 5: Invest, sit back and let the debt mutual funds do their thing - which is - attempt to generate a small but resilient stream of income through informed investments in debt instruments. You can watch your money grow on the FundsIndia investment dashboard - either online or on your smartphone through the FundsIndia app. You can track and manage your investments in the highly intuitive app-based interface. Buy, sell, trade at the touch of a button. Lump Sum investing: This method is for when you wish to invest your corpus (money) at one shot. Systematic Investment Plan investing: SIP is for when you wish to invest small amounts of money at regular intervals for a specific tenure. But this approach cannot be taken for investments in fixed maturity plans - as the investment has to be done during the initial offer period only. Debt mutual fund schemes are often seen as an alternative investment to fixed deposits - as they provide income over time. Fixed deposits usually have mandatory lock-in periods and/or take a long time to process withdrawals when an investor wishes liquidate the investment. Debt mutual fund schemes, especially liquid funds, have a high degree of liquidity and investors can ‘cash out’ their investment far more quickly than most other comparable investment options. While it is true that long-term and short-term capital gains tax does apply on debt mutual fund schemes, it should be noted that the benefit of indexation increases after three years of holding and with each passing year after that. Also, debt schemes are not affected by TDS. Alternative investment options like fixed deposits have a straight deduction of 10.3% if the interest income exceeds Rs.10,000 in a single year. The income on fixed deposits is also taxed every year from the start of the deposit, but the total money earned will only be accessible on plan maturity. Money that’s been invested in a debt fund scheme can often easily be transferred to an equity scheme or any other scheme of the investor’s choosing. Alternative investment options do not provide this level of flexibility to investors - e.g. fixed deposits can only be opened or closed, not transferred. When compared to the traditional options like savings bank accounts or fixed deposits, debt mutual funds offer the possibility of far higher returns. How to calculate the value of a debt mutual fund? One can invest in debt mutual funds through an SIP or through a lump sum investment, both of which have their own benefits and drawbacks. Bear in mind, however, that some types of debt mutual fund schemes like Fixed Maturity Plans cannot be availed through the SIP method. To learn the potential value of your investment into a mutual fund scheme on redemption, use our state-of-the-art mutual funds calculator. The value of a mutual fund scheme is determined in large part through its Net Asset Value or NAV. The NAV of mutual fund schemes rises and falls based on the performance of the instruments and assets in which they’ve invested.